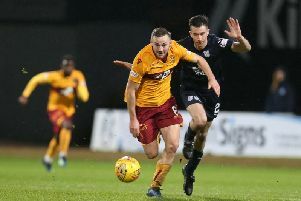 A succession of megabucks Premiership hitmen have failed to find a way past Leicester ’keeper Kasper Schmeichel this season - so perhaps they should seek some advice from Motherwell striker Scott McDonald. As our picture shows the Aussie frontman got the better of the Great Dane during an SPL match at Fir Park in 2007 when Schmeichel was on loan at Falkirk. McDonald’s moment came eight minutes from half-time when he rounded Schmeichel to put ’Well - already leading by a Darren Smith goal - into a 2-0 lead. But the Bairns came roaring back and strikes by Thomas Scobbie and Patrick Cregg plus a Stephen Craigan own goal put them 3-2 up before David Clarskon fired home to earn Motherwell a share of the the spoils. Motherwell: Graeme Smith, Corrigan, Craigan, Reynolds, Danny Murphy (Quinn 8), Darren Smith, Kerr, Vadocz, Paterson, McDonald, Keegan (Clarkson 57). Subs not Used: Meldrum, McCormack, McGarry, McBride, Fitzpatrick. Falkirk: Schmeichel, Ross, Barr, Scobbie, Milne, Cregg (Mcstay 69), Latapy, Craig (O’Donnell 86), Gow, Finnigan, John Stewart. Subs not Used: Lambers, Uras, Moutinho, Lima, Mitchell.